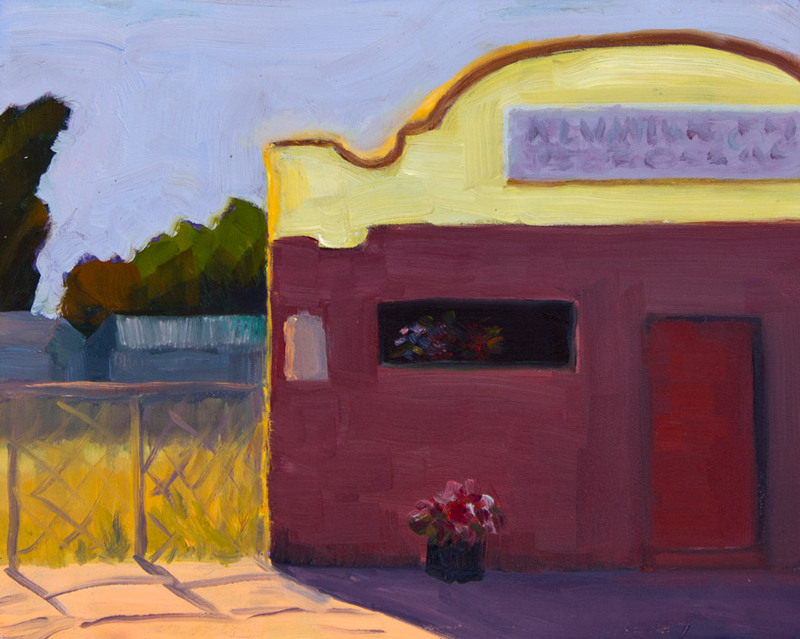 Alvarado Bar and Grill, San Pablo; oil on panel, 8x10"
I recently began painting twice a week with the East Bay Landscape Painters whose members are preparing for a show of urban paintings of unexpected, nothing-special spots. For two Saturdays we painted on the unlovely corner of McBryde and San Pablo Avenue in Richmond. I set up my easel by the air and water pumps at this gas station and set to work. I sketched out the composition and started painting the building when a huge semi truck double-parked right in front of it and began unloading produce for the market next door. My view was just about like this so I started on the empty lot next door. Half an hour later the truck left and I could finally paint the bar. I was happy with the above painting; a rare occurrence when I paint plein air. 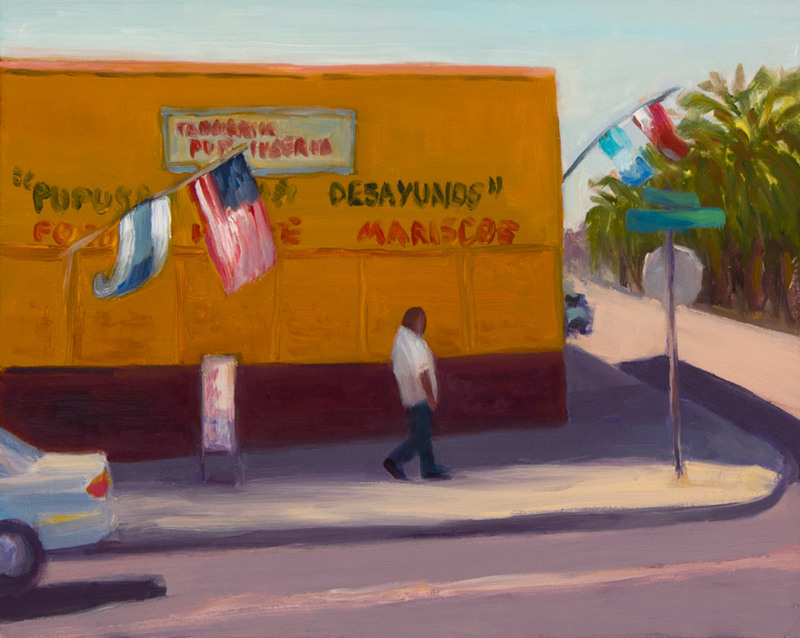 Pupusas and Desayunos; oil on panel, 8x10"
The next Saturday afternoon we returned to the same corner. It was hot so I set up in a shady spot under this tree in front of a used car dealership and painted the Pupusas place across the street. Rebeca Garcia-Gonzalez also painted the Pupuseria, except she worked on an enormous canvas (maybe 24×30″) and her painting was fantastic! She also tells a funny story here about the day and the idea behind painting nothing-special spots. While we were having our critique in the shade of the Fish and Chips place, one of the artists who’d left her chair and easel set up across the street by the pupusas shop just happened to look over her shoulder. She saw a guy jump out the side door of a van and pick up her folding chair. She started yelling at him, ran across the street and grabbed it back before he could stick it in the van. He took off and returned to our critique. Both are really nice, but I really love the top one! Very dramatic – simple but effective. Really nice work, Jana – thanks for the inspiration. I must get back to painting now that things have settled down here. Wowee!! I love them both but especially Alvarado Bar & Grill. Super nice. I love the warm, sunny color that’s hitting that sidewalk at lower left. You nailed that. These are both very strong. You’re growing by leaps and bounds! I had some catching up to do here…and I love what you’ve been doing. These are terrific! Have to laugh, now you’re experiencing heat, and we’re actually getting fall weather, which we rarely get!